The site for Holmleigh Children’s Home off Foundry Street was originally the town workhouse. This was opened in 1838 and replaced the small workhouse in St Mary’s Square. The building was designed by George Gilbert Scott, later Sir George, and perhaps one of the better architects, well known for designing the Albert memorial in London and the Martyr’s Memorial in Oxford. It was built to house up to 200 people, plus additional temporary accommodation for vagrants. Although quite full during the years leading up to the depression, at the end of its life in 1933 it held only 80 people. Treatment was very harsh in the early years of the 19th century, as workhouses were overwhelmed with more and more destitute babies and children. Following the Factories Act when children under 9 could no longer work in factories etc., Parish Authorites began apprenticing children out to chimney sweeps etc., without any enquiries as to their care. But gradually conditions eased as more laws were introduced to protect children; the most influential being the 1870 Education Act which introduced compulsory schooling. Attitudes of Guardians changed often insisting workhouse children should be dressed as other children attending school, but some were still obsessed with keeping down the rates. Several of Horncastle’s more famous residents such as JE Chatterton, Rev’d Brice Smith and Dr Jessop were on the Board of Guardians and towards the end of the century, children were being taken on outings to the seaside, courtesy of JT Friskney, and the Guardians supplied food and fun aplenty at Christmas time. Horncastle became recognised for its kind treatment of these unfortunate people. There were also improvements in their day to day care with water closets and a bath being installed, water provided to the upstairs wards, feather beds for the sick and purchases of books and periodicals. In 1933 the old buildings became a children’s home for the whole of Lindsey. This was seen as a very progressive move by the Lindsey District Council. They arranged for most children in the workhouses at that time to be fostered out to families but the remaining 104 children who were in workhouses around the county were brought together in what was renamed Holmleigh. It was intended to provide a more homely and supportive atmosphere for the children. The official opening was in September 1934. Within 4 years 5 pairs of cottage homes had been built and provided homes for 180 deprived children. The area just outside the archway continued to be used for many years for the vagrants in the town. During the Second World War these were used as a hospital for evacuees. After the war these areas also became part of Holmleigh. Why did children come to Holmleigh? Some children were sent to the Home by the Juvenile Magistrates after they had got into trouble or the magistrates felt they were in moral danger. In one case the Mother was felt to be having too many male visitors and as a reaction the child became destructive and difficult to control. Unfortunately there were also cases where Mothers could not tolerate a child for some reason. One such child had been brought up by his grandmother, but when she became ill he came to the home. Some mothers had no choice but to put the child in the home when they had no man to support them. Such a case was a single mother who was a Jewess and had lost all her family in the holocaust and could not provide for her daughter. Like some other mothers and relatives, she visited her child often and was pleased with the way they were cared for. Many children had parents who didn’t understand their parental responsibilities and neglected the children. Often all their children had to be taken into care. Some of the children were mentally handicapped and the parents couldn’t cope. The Home tried to re-house these children to units that catered specifically for their problems. Of course, there are also the extremely sad cases of babies abandoned – one on the sands at Skegness and one in bin in a cinema in Grimsby. At least they survived and were cared for, and often adopted. We won’t go into some of the cruelty that brought children to this home. When the children arrived they came into the Receiving Home and were thoroughly bathed, their heads were washed and they were given a set of clean clothes as sometimes their bodies were in a filthy state and some had little toilet training. They were kept in the Receiving Home whilst medical and psychological assessments could be made. This period was kept as short as possible so that children could be quickly assigned to the new ‘family’ in a cottage home and begin to feel secure. When the child was ready to leave the Reception Home they were transferred to a Cottage Home. Up until 1953, the homes were segregated but policy was changed to encourage a more realistic family atmosphere. The cottages were semi-detached and could accommodate 15 children. The setting of the homes and their layout was all formulated to try and ensure that, often troubled children, could feel a sense of peace, comfort and security. The 10 cottages were set amid lawns with flower beds and vegetable gardens, which were kept tidy by 2 gardeners and 2 assistants. There were also a children’s playground and tennis courts. Babies had a separate play area near the orchard. All the other domestic buildings such as stores, laundry, workshops, offices and the hospital and nursery were situated at the other end of the estate. Each home had children from 5 to about 18 and had a policy of keeping siblings together, so there were often several brothers or sisters in each home. It was vital that these children adapted to the environment of the home and could then live in a happy, secure and friendly atmosphere. Outside each home there was a small lawn and at the rear a small yard which contains the well-stocked coal house. On the ground floor the first room would be the staff’s private sitting room, equipped by the Local Authority with easy chairs, sideboard and table. The decoration is chosen by the staff. Next to this is the spacious kitchen, which is kept very clean. It has a large gas cooker, a boiler stove and double sink. A large table in the middle was used for preparation and for the children’s breakfast. 2 large storerooms contain the large quantities of crockery etc necessary for such a large ‘family’ and the other for food supplies. Vegetables were usually brought in fresh daily. Further along the corridor you have the children’s’ small washroom with 6 handbasins. There are also lockers for each child to put their play shoes in when they change into their house slippers in the evenings. There are also sets of numbered pegs and shelves for towel, flannel, toothbrushes, hair brush comb and tin of toothpaste. These are carefully divided from each other to stop the spread of infection. The washroom is scrubbed every night. There are 3 toilets downstairs for use by the children day and night. The most important room in the cottage is the children’s ‘day room’ with a fireplace at each end for warmth. The 2 large dining tables are situated at one end, and there are bookcases and easy chairs and interesting pictures. The children’s personal lockers are situated here containing everything the child treasures. Even the Mother cannot go in these without the child’s permission. Upstairs the first door leads to the Mother’s bedroom where again her personal taste was allowed. There is a window into the children’s dormitory. There were 2 large dormitories both well ventilated with eight beds each and a large wardrobe for the children’s best clothes. Upstairs fireplaces were only used in times of sickness. Next to this was a large airing cupboard used for the sheets etc when they come back from the laundry on a Friday. Next to this was a small staff toilet, and for use by very young children during the night. In the bathroom there was one large bath and two hand basins and a small hand wringer for quick washing during the week. The hand basins were for the staff, but the bath was for staff and children. Again there were numbered hooks for the individual towels and flannels. Hygiene and avoidance of cross contamination were paramount. All the decoration throughout the homes were very pleasant and chosen with care by the Mother and Aunty in each home to create a happy, cheerful atmosphere. So, what else was provided to help these children grow into well adjusted adults? Like most children of that time, they had 3 sets of clothes – one set new each year for Sunday best- suit, dress, shirts, tie, vests, knickers, socks, shoes and topcoat. Their Sunday best then became school clothes and school clothes became play clothes. Over the age of 14 they had some choice in the clothes they wore. Boys had 2 clean shirts every week and vests and underpants were changed weekly, whilst pyjamas were changed every fortnight. In this they were probably often more fortunate than children in a normal home. Quite a difference to what we expect these days! Shoes were cleaned by the children every night, and they were expected to inspect them and, if they needed repair, put them in a sack for the cobbler who collected 3 times a week. This was also part of teaching the children responsibility. They were also taught to darn their own socks. A barber visited 3 times a week and boys had their hair cut every 3 weeks. Girls could chose their own style as long as it was simple. Every Saturday the children received some pocket money. · 5-8 1 shilling "
· 9-11 1 &6 "
· 12-13 2. Shillings "
· 14 & over 2 & 6 "
This was given to them to learn the value of money and to encourage independence. They were also taught the importance of saving, especially for extra treats, holidays, presents etc. They were encouraged to do their own shopping when they went into town, and for this they planned for days before. They looked in the shops on their way to school before deciding what to buy, and looked so proud when they came out with their purchases. On Mondays & Thursday evenings there was a film show in the Assembly Hall. On Saturday nights there was television for infants from 4pm to 6pm. On Saturday nights there was a dance for older children from 7pm to 8.30pm, after which they could watch television until 10pm. On Wednesday night some boys took part in Physical Training. Children were sometimes taken to the cinema by the Aunty. Children were encouraged to take up a special craft and some enjoyed building boats or helping the maintenance team or the gardeners. The latter also helped them build relationships with male adults who were often called ‘Pop’ or ‘Dad’. The Home had its own Guide and Scout packs and were encouraged to join the church choir or school clubs to further their experiences of working with groups of people. Although the staff produced and provided the pantomimes, the children were also involved and helped with the preparations and some took part in the chorus. Birthdays were celebrated very well and everything possible done to make the child really happy, such as breakfast in bed, no housework and choosing his tea. The Mother always made a Birthday cake. An annual trip to the seaside was established fairly early on at Holmleigh. The whole home moved to either Skegness or Cleethorpes. They were out playing all day with a picnic lunch and a dinner on their return. Sometimes boys were taken to the Norfolk Broads and spent a glorious month on a boat. Children were encouraged to attend church or chapel and attended with Assistant Mothers who also taught them how to behave in church. Children joined Youth Clubs, Scouts, Guides etc. Not all for pleasure – they also had a lot to learn. All the children attended the local schools. The young ones were taken by the Assistants but older children made their own way. Several children went to the Grammar school with some going into the sixth form and further education. Unfortunately, the school reports often indicated that these children were not as bright as they could be. Perhaps this was down to inherent poor intelligence, or lack of personal attention and insufficient experiences. They were fiercely loyal to each other and tended to play together at school. They were often suspected of petty pilfering or not telling the truth. Again perhaps due to their environment. Their emotional disturbances showed in other ways too. Mothers learnt to deal with these problems in as gentle a way as possible as encouragement proved more effective than scolding. She also looked for the signs of problems and encouraged the child to talk about it and find ways of dealing with it. Adoption – Children had to be fit mentally, physically and morally before they were recommended to Foster Parents. The child then visited the foster parents home for a short period to see if he can settle well, and that the foster parents can meet his needs. The process was quite strenuous. When the children had to leave school at 15 they should have been ready and capable of taking their place in the adult world. They were helped to choose a suitable job and they were equipped with 2 full sets of clothing so they had no need to spend their first few weeks wages on clothes. This included 3 pairs of socks and 2 pairs of underpants! When they start their job they are transferred to a Boarding House near their work or a Residential Home under supervision. They usually consider Holmleigh their home and often visit regularly and spend Christmas at Holmleigh and their holidays at ‘Camp’ with everyone else. The home was under the overall control of a Management Committee of Lindsey County Council. 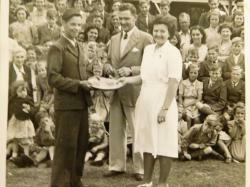 When the Home opened in 1934 until 1939 – Superintendent Mr Wilkinson & Matron Mrs Wilkinson. Comments indicate that the home was very institutionalised under their supervision and very strict. In 1939 Mr Norman Vardy and his wife Elizabeth took over. The Deputy Matron, Mrs Hatfield, and her husband, Mr Hatfield, Assistant Supervisor came to the home in about 1945 and are seen in many of the photos and appeared to take major parts in the annual pantomimes. They went on to run the Eagle Lodge in Woodhall Spa. Miss May Blackburn was one of the longer serving members of staff. She ran the nursery from 1940 to 1960. Her assistant was Miss Scott. Miss Blackburn also ran the guide unit at the home. Home 6 – Miss Butler – longest serving house mother – Sept 1933 when the home opened until it closed in 1968. Later Home 3. Robert & Lilian Leatham – house parents to about 14 boys – 1946-47. Indicated that they left as they couldn’t cope with the harsh routines and wanted a more homely atmosphere. Mother and Aunty or Mother and Father were to create a happy family atmosphere, in which children could grow up to be responsible people. It was a long term commitment to a very responsible job as they could make or mar a child who is already handicapped by the emotional disturbances they have experienced. · To share in the community life of people in a homely environment. 1) 7.00am wake up children and supervise as they make their beds, clean up the linoleum and open windows. 2) Whilst the children are getting washed, Mother cooks breakfast. Older children wash up whilst Mother and Aunty help younger children to dress. All children are then inspected by Mother prior to her completing a very detailed daily report on the children. 3) Whilst the children are at school the mothers prepare the mid-day meal, although the potatoes were peeled by the children the night before. They also clean the sitting rooms, order provisions, sort laundry and scrub the larder. 4) When the children return at mid-day, they get washed and lay the table. Mother serves the food and the eldest child says grace. Mother and children wash up together and lots of chattering. Staff are allowed 2hours off in the afternoon or evening. 5) In the afternoon they prepare jellies and pies for the following day and the bread and butter for the children’s tea. They do any sewing or mending. 6) Children return from school and have tea at 4.30pm and tell staff about their day. Older children help with washing up and the young ones go out to play. 8) Staff have their tea at 8.30pm and finish mending, darning, etc. Must always be cheerful friendly and diplomatic no matter what. The Nursery as under the control of Miss Blackburn with her assistant Miss Scott. There were about 20 nursery staff in all. Toddlers were woken, dressed and ‘potted’, often howling, on a row of tin chamberpots on a cold concrete floor. They were given a breakfast of porridge and bread and butter. In bad weather they played with toys in a large room or in summer time they played outside. Sometimes the nurses had to take them for a country walk which was an ordeal, as they were in huge prams seating eight, and they all had to be dressed in coats, hats, gloves, etc and then they had to stop often to wipe noses, and find pulled off shoes. After lunch children were coaxed to rest in the sun room. Then it was toilet time again and further play followed by tea, more play and finally bathtime and bed. One of the worst duties was sluicing nappies off, -needed to wear a mask. At times of illness, the nurses had to minister to the sick babies. They experienced epidemics of whooping cough, measles, and gastro enteritis. They also saw the worst of society with the state babies were brought in suffering from burns, malnutrition and other abuse. Tough work! Later recollections indicate vast improvements in the care of the babies. The social life for staff at this times was quite good unlike the restrictions on staff in the 1930’s when boyfriends were not allowed anywhere near the home and a lot of goodbyes took place at the end of the long drive. They also had to be in by 10pm so often missed the end of a film. Staff attended dances in the Home and in the town. They could go to the cinema or watch television in the Main Hall. During the winter months a lot of time and effort went into the annual staff panto which played for 3 weeks and was very popular with people from the town. All proceeds went towards paying for extra treats for the children. By the 1950’s staff were encouraged to attend training courses which were very helpful in understanding the problems and needs of the children. They were paid to attend. The wages for House mothers were considered quite good at the time - £330 - £390 per annum with £100 deducted for keep, but they earned every penny of it. They started work at 7.00am thro to 2pm and then 4pm to 8.30pm and on call all through the night. They had one day of per week and 5 weeks holiday with pay, but had to be in the Home during Festive seasons. Probably one of the reasons many did not get married. However, many felt that the real reward was seeing a child who had been under their care go out into the world, a responsible and capable person. Many kept in touch with their ‘Mothers’ and after the home closed in 1968 several of the staff continued to care for the children in their own homes until they were old enough to leave. Many children regarded Holmleigh as ‘home’ in the fullest possible meaning of the word – a true accolade for the staff who cared for them. In the 1930s the former Union Workhouse was converted into a children's home and renamed Holmleigh. A number of "cottage homes" were erected to the south of the original building - each cottage held 20 children. Holmleigh was closed in 1968.